120 pages | 1 B/W Illus. The book is filled with specific examples and vignettes from elementary, middle, and high school classes, so you’ll gain helpful strategies no matter what grade level and subject area you teach. You’ll also find out how to make tweaks or hit the "reset" button when something isn’t going as planned. Things may not always go perfectly your first year, but the practical advice in this book will help you stay motivated on the path to success! Bonus: As you read the book, get even more out of it by discussing it with others. Free study guides for practicing teachers and student teachers are available as eResource downloads from our website (www.routledge.com/products/9781138126152). Chapter Five: When a student follows the rules…or doesn’t. Section 2: The Students are here…now what? What do I Say When I Call a Parent? 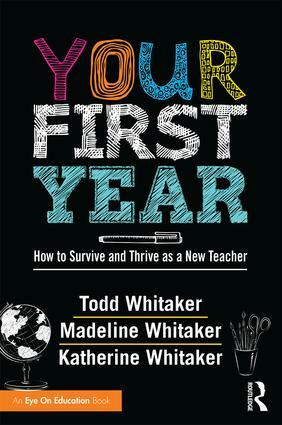 Todd Whitaker is a professor of educational leadership at Indiana State University in Terre Haute, Indiana. He is a leading presenter in the field of education and has written more than 40 books, including the national bestseller, What Great Teachers Do Differently. Madeline Whitaker is an elementary school teacher in Springfield, Missouri. Katherine Whitaker isa former middle school teacher who now teaches high school in Kansas City, Missouri.